Having completed a 14-day-journey in Korea, Dr. Bruce Waltke expressed an approval of Reverend Abraham Park’s ministry .Dr. Waltke pointed out that the current generation is inundated with liberalists and that evangelical churches in the U.S, are disappointingly becoming more corrupted due to material affluence. His first visit to Korea, he went on, was meaningful. He was thankful of the fact that he found a church that emphasizes the Word of the God like Pyungkang Cheil church. Further, he hoped that the evangelical churches in the U.S become like Pyungkang Cheil church. Also, he noted that in this period of crisis, the entire community of Korean church needs to be recovered and seek the wisdom of surmounting the attacks of materialism. In this sense, he suggested that other churches and pastors should set the ministry of Rev. Abraham Park and Pyungkang Cheil Church as exemplary. As for a long debate related with the ministry of Rev. 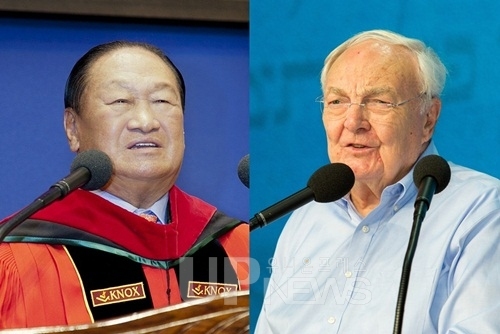 Abraham Park, Dr. Waltke clarified that Pyungkang Cheil Church is a great place of ministry and a place that professes the Word of God, thus he would keep his loyalty to him, as Benjamin's brothers stayed at his side when he was being accused of stealing. Dr.Waltke also remarked that he was greatly surprised by Rev. Abraham Park's extensive and profound biblical knowledge and that he is properly carrying the tradition of evangelical theology, dispelling the accusations of heresy on him. After reading the four books of The History of Redemption Series﻿ (the English version) written by Rev. Abraham Park, Dr. Waltke commented that the books are strictly bible-centered, fully showing that Rev. Abraham Park indeed speaks for the evangelical theology and that the pastors in the U.S as well must read his books.